How does one determine intelligence using astrological means? How does one even define intelligence itself? There are different types of intelligence that may be considered, but it’s difficult to be objective about any of them. 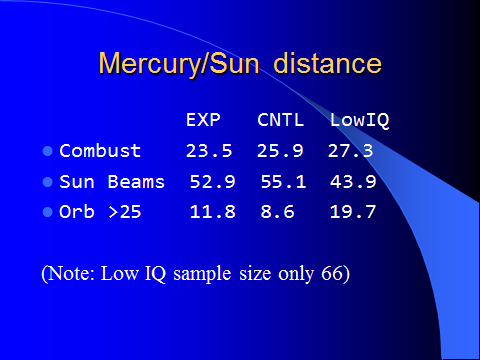 One way we can find some firm astrological correlations is to use an objective measuring device – qualification for membership in Mensa – a non-profit organization open to people who score at the 98th percentile or higher on a standardized, supervised IQ or other approved intelligence test. This article will examine and test various astrological factors with an experimental group of more than 400 people identified as having the trait “Mensa-Level Intelligence” in AstroDatabank 4.0. While some might quibble that there are too many definitions of what intelligence is to limit this only to those qualified to be members of Mensa, one should realize that one can only measure that which can be measured. Only by using verifiable data with good controls a can an objective measurement be made. For the purposes of this study, a control group with a size ten times the size of the experimental group that replicates demographic information and shuffles the birth year, time of the day, and place will be used to test various factors. There are some factors that have been used frequently to determine intelligence from the natal chart through the years. 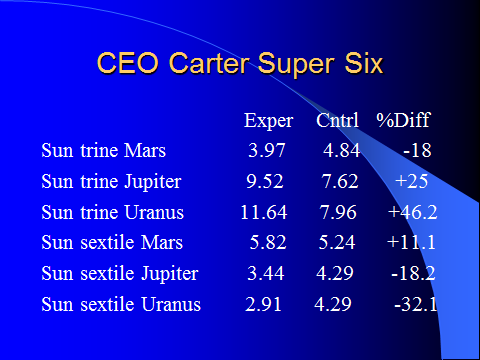 Some of those include: a strong Mercury, emphasis of the Air element, the speed of the Moon, and CEO Carter’s supposed “Super Six” aspects that denote intelligence. AstroDatabank 4.0’s Factor Analysis Report was also used to automatically sift through the experimental and control databases to identify other promising configurations. 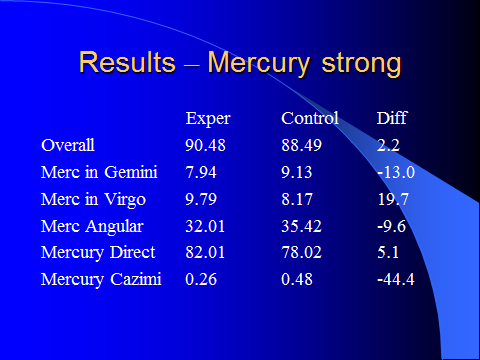 Factors considered when identifying a strong Mercury included Mercury in Domicile, Angular, Direct and Cazimi. As one can see, the results in some cases are completely counter intuitive while some are rather strong positive results. 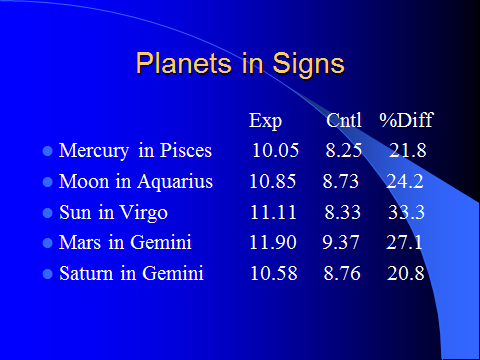 Mercury in Virgo had very good positive numbers, while Mercury in Gemini had negative numbers. 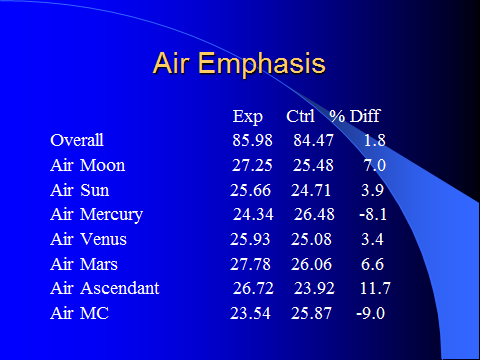 As we can see, the only somewhat strong factor is having an Air ascendant. There was some strong positive correlation there – but not for all six. Sun trine Jupiter and Sun trine Uranus show a strong correlation – but Sun sextile Mars was only barely above a ten-percent difference, and Sun trine Mars and Sun sextile Jupiter or Uranus show strong negative numbers. So, one can see that not all the factors mentioned in astrology literature hold up to scrutiny when tested with a group of Mensa-eligible people against a control group. But what factors do show strong correlations? That’s a job for the Factor Analysis Report in AstroDatabank 4.0. Surprise – Mercury in Pisces! 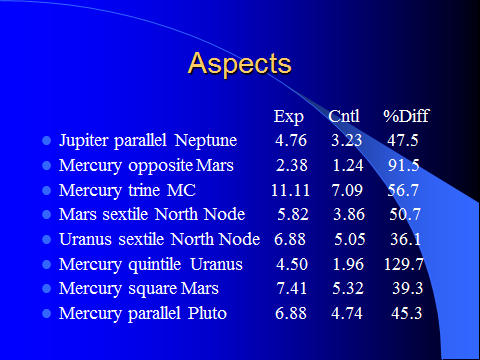 The strongest number against a control group showed Mercury in both its Detriment and Fall in Pisces as the strongest placement for Mercury the Experimental Group – even stronger than being placed in Virgo. Could Mercury in Pisces denote deeper levels of thought? The Sun in Virgo fares well, as do other planets disposed by Mercury: Saturn and Mars in Gemini. The Sun in Virgo could point to analytical thought – as Saturn in Gemini denotes disciplined thought and Mars in Gemini could show aggressive thought. The Moon in Aquarius – an intellectual detachment from emotion, perhaps – also makes a strong showing. This breaks things down a bit from the just the Angular designation, and does show a strong result for Mercury in the 10th House – but also in the 2nd House. 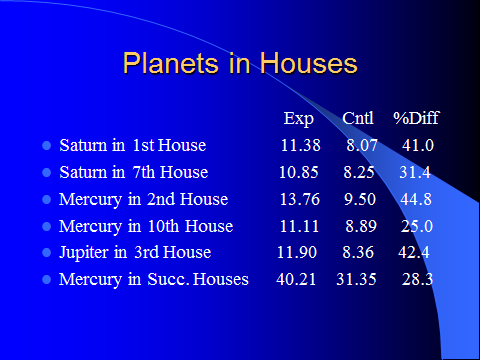 Saturn in the 1st and 7th House also figures strongly, as does Jupiter in the 3rd House. But what about aspects? While aspect numbers are a bit smaller due to their nature (I used a 5 degree orb in AstroDatabank for all aspects since the program doesn’t allow a search using moiety of orb), some are rather interesting to look at. What stands out most is the Mercury trine MC – since the Experimental group’s percentage is above 10 percent and the percentage of difference is higher than 50 percent. To me, that is a rather strong correlation. All other astrologers and researchers whose work I’ve been able to build upon – or contradict.